A harrowing story of blue on black violence, of black lives that seemingly did not matter. On September 4, 2005, six days after Hurricane Katrina’s landfall in New Orleans, two groups of people intersected on the Danziger Bridge, a low-rising expanse over the Industrial Canal. One was the police who had stayed behind as Katrina roared near, desperate to maintain control as their city spun into chaos. The other was the residents forced to stay behind with them during the storm and, on that fateful Sunday, searching for the basics of survival: food, medicine, security. They collided that morning in a frenzy of gunfire. When the shooting stopped, a gentle forty-year-old man with the mind of a child lay slumped on the ground, seven bullet wounds in his back, his white shirt turned red. A seventeen-year-old was riddled with gunfire from his heel to his head. A mother’s arm was blown off; her daughter’s stomach gouged by a bullet. Her husband’s head was pierced by shrapnel. Her nephew was shot in the neck, jaw, stomach, and hand. Like all the other victims, he was black—and unarmed. Before the blood had dried on the pavement, the shooters, each a member of the New Orleans Police Department, and their supervisors hatched a cover-up. They planted a gun, invented witnesses, and charged two of their victims with attempted murder. At the NOPD, they were hailed as heroes. 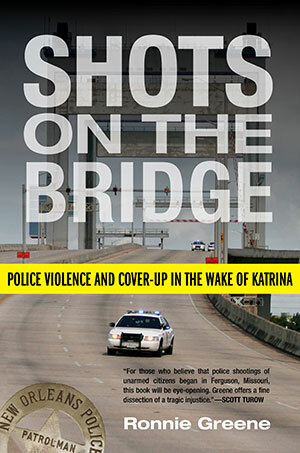 Shots on the Bridge explores one of the most dramatic cases of police violence seen in our country in the last decade—the massacre of innocent people, carried out by members of the NOPD, in the brutal, disorderly days following Hurricane Katrina. It reveals the fear that gripped the police of a city slid into anarchy, the circumstances that drove desperate survivors to the bridge, and the horror that erupted when the police opened fire. It carefully unearths the cover-up that nearly buried the truth. And finally, it traces the legal maze that, a decade later, leaves the victims and their loved ones still searching for justice. This is the story of how the people meant to protect and serve citizens can do violence, hide their tracks, and work the legal system as the nation awaits justice.